I can't attach the camera to this setup for an afocal approach because my lens is too long, which doesn't change that even 1 mm specimens are way too large to see through the eyepiece using the Nikon objective - also the short (5 mm) working space makes lighting difficult (side lighting is not good for my specimens). 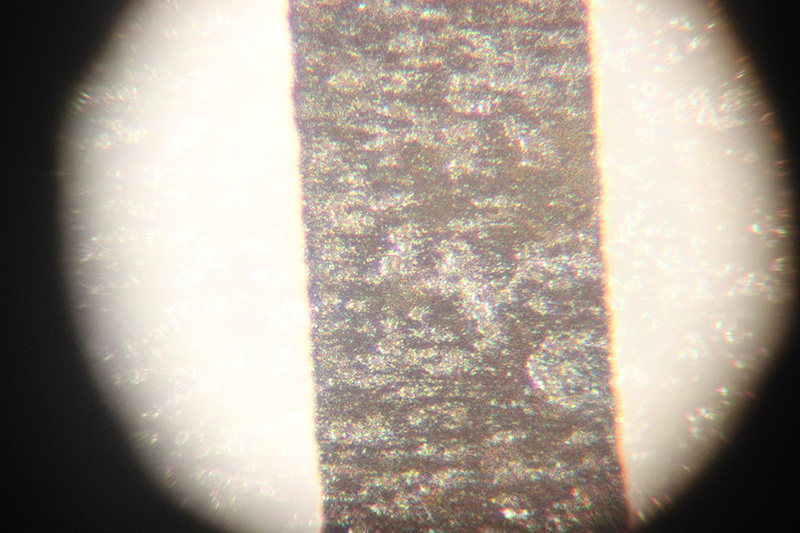 I'm likely to give up on the compound miscroscope approach as my specimens are mounted on pins and the good clearance on the zoom scopes works well for that. I've also included a specimens picture done with a stack of 5 images through the zoom microscope - it is not bad, but I would think it might even be better if I wasn't using n 18-55 mm zoom lens. What might be the best lens to use for an afocal approach? Besides the f1.8 50 mm Canon makes (and the much less expensive Yongnuo version), there is also a 40 mm f2.8 lens, would either of those be better than using my macro lens? Anyway - I'll keep fiddling but compound scope may just not be practical for me to use. If the field number of the scope is (say) 18 then your field of view would be 18/20ths of 1mm diameter with a 20x objective. That's about what you should see through the eyepiece. If your optical coupling to the camera isn't ideal, which is the case, you're likely to lose some of that. You need a high-enough eyepoint eyepiece and a camera with dimensions something like an eye, as in Rik's reference post. An old humble compact which has little or no zoom, is likely to work. The photo you posted is pretty poor. If you look at the 4x lens tests here (link coming) , where the full field of view is 22m, you'll see that you could get a sharper image of your 1mm sample with one of those than you're getting now. Working distance would be of the order of 20mm, which should be enough. A 10x objective would have a working distance of the order of 7-11mm, and of course suit a say 1.5mm specimen better. I find that working distances down to about 4mm are ok - it does take practice! The way the "finite" objectives were tested in that 4x test, was by "direct projection". No lens other than the microscope objective was involved. To do that, you'd remove the microscope head, fit an adapter, then plain tubes, and another adapter to the camera. Cost is something about 20 + 5 + 2 dollars, if you wait for China post. Microscope end adapter (check your dovetail diameter) 44/36mm Dovetail adapter to M42x1mm EDIT NB Don't get T42, different thread, won't fit tubes. I think a properly done 4x objective stack should provide better image quality than your photo #2. And its working distance would be much more than 5mm (though exact WD depends on the particular objective - the Nikon S 4x has a relatively short WD). 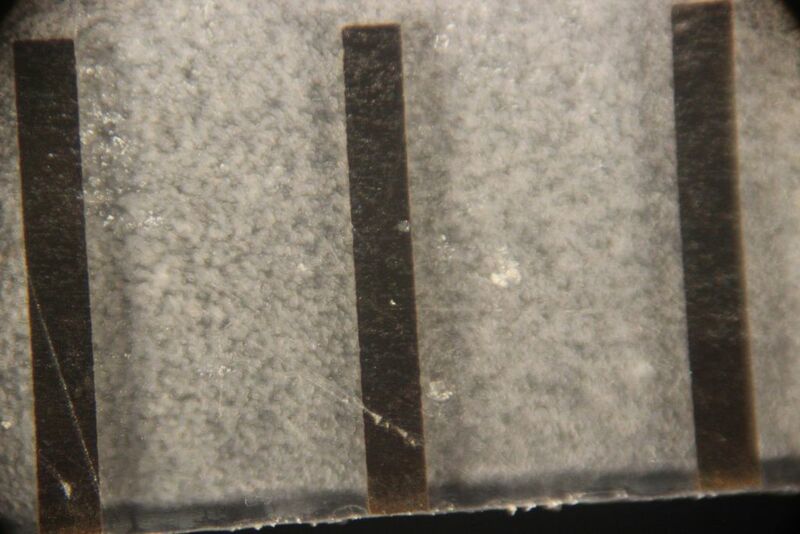 In your photo #1, you were clamping on the lower end of microscope eye tube. Would clamping higher provide more space for your 40mm or 50mm camera lens? There are physically short 50mm "pancake" lenses. You do not need large aperture for afocal imaging. F/2.8 is enough. Vintage prime 50mm lens can be had for cheap. For example, I just saw a Minolta pancake 50mm F/1.8 lens at a local estate sale, for $30, including a film camera (but I did not buy it as I already have what I need). You don't have to use that Orion afocal adapter. As I mentioned previously, you can glue an extra microscope eyepiece to step-down lens rings and then screw lens ring onto front of your camera lens. Assuming everything fits, of course. Mine did, luckily. Also, can you bend your pin? Remove pin or lay specimen differently to allow more space for side light to get in? Maglite Solitaire LED Flashlights flat on microscope stage, then tightly wrap Vellum paper around specimen and objective as diffusion. In such case, even 5mm working distance is enough for me. But you may need to remove the pin though, if you work with such tight working distance. Actually 5mm WD from a M 20x objective that costs only $30 is pretty hard to beat (a microscopist usually has to spend over $200 to get close to or over 10mm of WD). I can not mess with the specimens in any way. These are 50-100 million year old catalogued museum specimens and are extremely fragile. I also usually publish these as stereo pairs which is a bit tricky at this working depths, but I'll figure that out. If I'm to improve these I'd prefer reasonably easy fixes such as: Is there a better 4X objective I could be using? My specimen size limit is going to be ~2 mm - if there an approach for 3-4 mm specimens? Again - my macro lens seems to see everyhting in the eyepiece and I like the T3i because of the live view and the 5X-10X focus enlargement and would like to stay with that camera. Would a different lens really improve things? At the moment I'm just using the image stacker in Photoshop but I know everyone is not thrilled with that. Is there a low cost or free software that does it better? I again thank you for your time and hopefully I will not bother you much more! I see nothing obviously wrong in your images. You probably just need better light diffusion, which should provide you a significant enhancement of image quality. Your difficulties with stacking at 20x objective may be due to flare and lack of diffusion. Also, if your camera has EFSC (electronic first shutter curtain), using that will improve image quality significantly (when you crop). For high magnification lighting on budget, please refer to my previous post on using Maglite Solitaire LEDs and Vellum paper. Office paper will work too, though it will eat too much light. Use at least 2 (preferably 3) LEDs for your sample. Rik or others can correct me if I am wrong: your aperture setting of F/11 seems too conservative. I am guessing F/8.0 will work better. And you don't have to use a macro lens. In fact, a regular 50mm (none zoom) prime lens that can focus at infinity may work slightly better (probably not a lot through). If your Tiyoda 4x NA 0.12 objective provides you enough working distance, then you don't have to change it. Some older Tiyoda optics are copies of old Zeiss Jena design, which works pretty well at 4x-10x and may not even need much eyepiece compensation. CombineZP is one of those free focus stacking softwares. There are a few more free ones that I cannot remember. No problem Jeff, we often have to investigate a few unfruitful methods before finding something suitable. I don't know why you're only seeing just over 2mm. It's showing CA obviously. Yes there are better cheap objectives, but then your eyepiece may not be suitable for them. if your current eyepiece is an Olympus, that may not be suitable either. I think your lighting needs improvement. Light coming from below will cause flare in the image. Directional light will encourage speckle and reduce resolution. I suggest you use topside flash, to exclude vibration. Small cylinders of tissue paper placed around the subject as diffusers, using mirrors/ reflectors if you have to, may work to give somewhat better results with you current objective. Seeing your latest image - definitely use more diffusion. 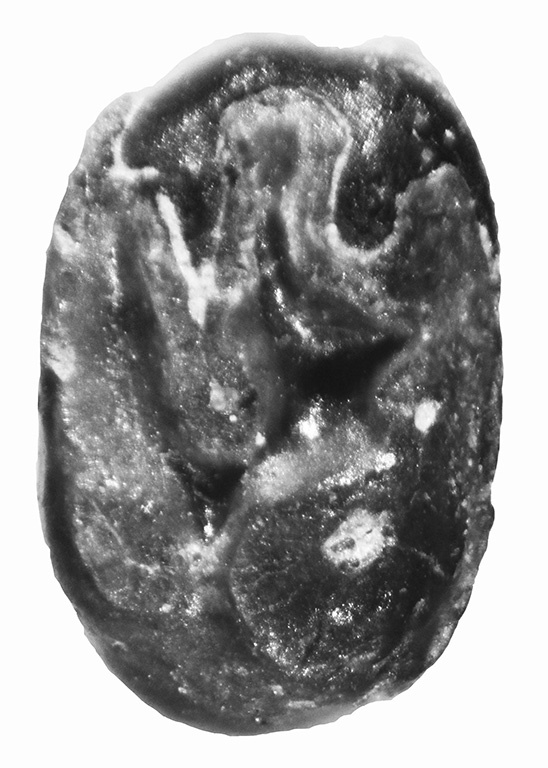 What is it, a fossilised seed? 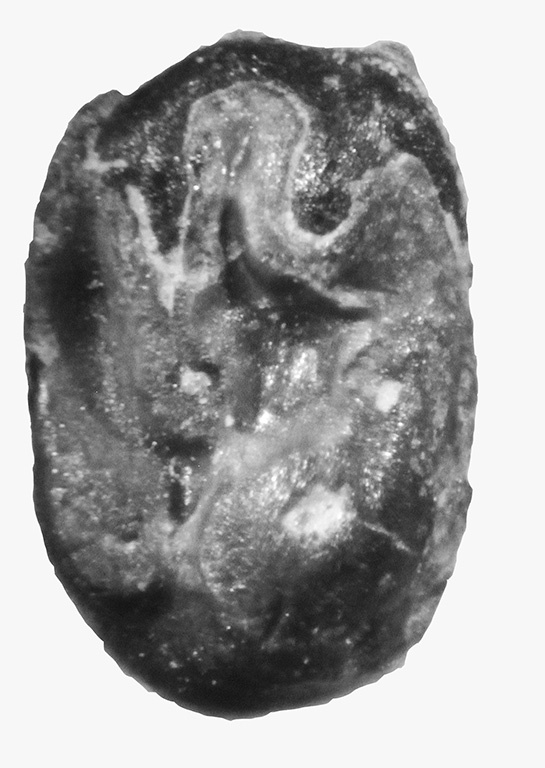 Rodent coprolite??! 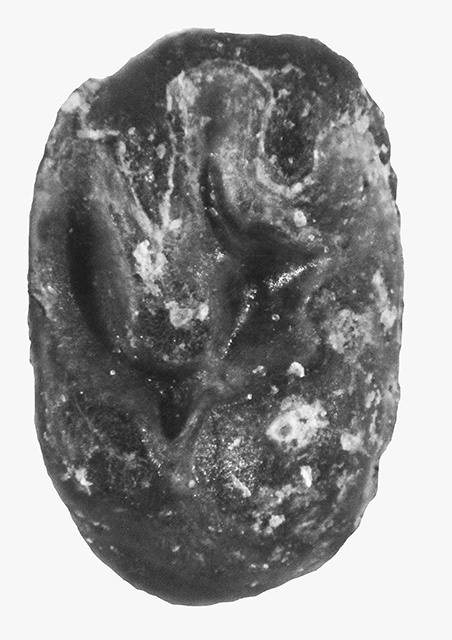 This is an upper molar of a rodent. The eyepiece i sWF10X made by "TECH INST CO." I've been using fiber optics illumination - I'll work on diffusing the light. With a 4X objective I won't be able to take pictures of specimens much larger than this one. Is there something odd about this microscope that I am limited to 2 mm with a 4X objective? I bought this through Ebay and could still returned it and look for something else? Do you see about the same field of view though your camera that you do eyeballing through the eyepiece? The microscope looks ok (to me) and it does benefit from some 30mm of fine-focus travel, good for stacking. 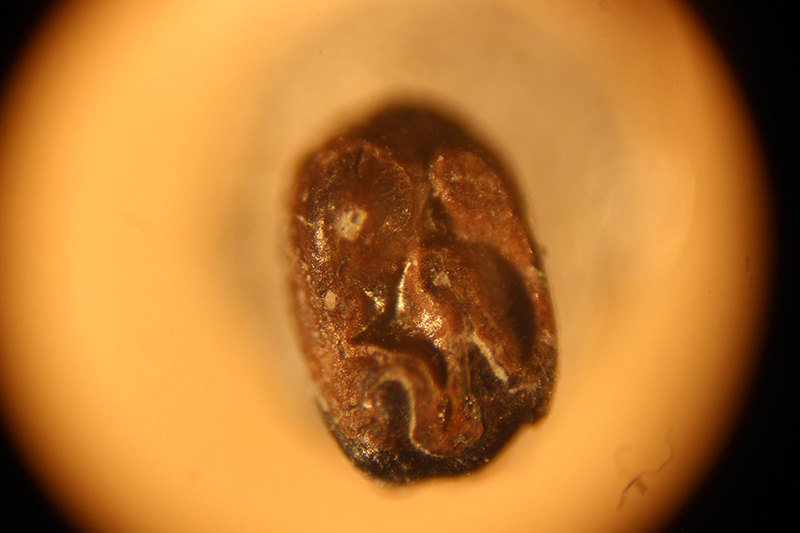 I took some a pictures of a vole's dentine, to identify it from an owl's pellet. It was, I noted at the time, remarkably lacking in fine detail. I imagine they get rougher over the millenia, but I have some sharks' teeth which are old, but are hard and shiny, like recently living teeth! This specimen is particularly hard to photograph because much of the dental enamel has been removed during sedimentary transport - so much of what I'm photographing for that specimen is dentine. I do have other nicely enameled specimens. I do love the fine focus travel. I don't get the full field of view through the camera and with the 18-55 mm lens the front of the lens is almost in contact with the eyepiece. I think another lens might give me both a better image and a better view of what comes through the eyepiece - I just have no idea what would be a more appropriate lens. I'm not sure whether your camera has ideally to be able to focus with its lens fitted, to infinity, so I won't recommend any lens. I've seen 50mm f/1.8s, and "Pancake" 40 and 45mm lenses, used. Hopefully someone who knows for sure will chime in. Nikon would be expensive, anything else might be very cheap but would need a (cheap) adapter. Can someone else help please??!! 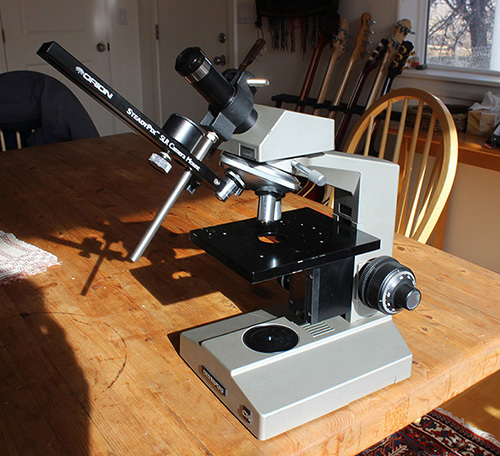 Remove the microscope head at the swivelling dovetail, and take the lens off the camera. Find some cardboard tube so you can position the camera such that the sensor would be 150mm/6" from the rear flange of the objective. (not critical). That's "direct projection", and you should get an idea of what the objective actually covers. If you exclude light and make it rigid enough (tripod? ), then you could have a go. I did, to begin with, and it worked. Flash strongly advised because of wobbles. If you move just a little laterally, between frames, it doesn't matter much because the stacking software will align them for you. Proper adapters are described above. One caveat, if you put your eye to the camera end of the cardboard tube and look in, you don't want to be seeing any reflections of anything, or a shiny ring on the back of the objective. A rolled up tube of black paper slid in, will almost certainly sort it, maybe with a little black sticky tape.. This method goives good results. A high eye point eyepiece should project image higher for your camera lens to pick up. And ideally, your camera lens should focus to infinity when doing afocal. But I am not sure the above will significantly improve your image quality (it may or may not, as it really depends on combination of optics). "With a 4X objective I won't be able to take pictures of specimens much larger than this one. Is there something odd about this microscope that I am limited to 2 mm with a 4X objective?" Another possibility is that your light diffusion or quality/intensity is still not good enough for your highly reflective subject. What camera iso did you shoot at? You want lower than iso 1600, if you cannot get to iso 200-400. I see improvement in your lasted image and am guessing it is probably good enough for scientific publication, though I haven't seen your fossil in person. Is it good enough for your eyes, is the stacked image quite close to eyepiece view, in terms of image quality?